This project was funded by the National Science Foundation DEB grant 9815938 to L.A. A.D.C. was supported by a National Defense Science and Engineering Graduate Fellowship. Why some social systems form groups composed of kin, while others do not, has gone largely untreated in the literature. Using an individual-based simulation model, we explore the demographic consequences of making kinship a criterion in group formation. We find that systems where social groups consist of one generation breeding associations may face a serious trade-off between degree of altruism and group size that is largely mediated by their kin composition. On the one hand, restricting groups to close kin allows the evolution of highly altruistic behaviors but may limit group size to suboptimal levels, the more severely so the smaller the intrinsic fecundity of the species and the stricter the kin admission rule. Group size requirements, on the other hand, can be met by admitting nonkin into groups, but not without limiting the degree of altruism that can evolve. As a solution to this conundrum, we show that if helping roles within groups are assigned through a lottery rather than being genetically determined, maximum degrees of altruism can evolve in groups of nonrelatives of any size. Such a “lottery” mechanism may explain reproductive and helping patterns in organisms as varied as the cellular slime molds, pleometrotic ants, and Galapagos hawks. 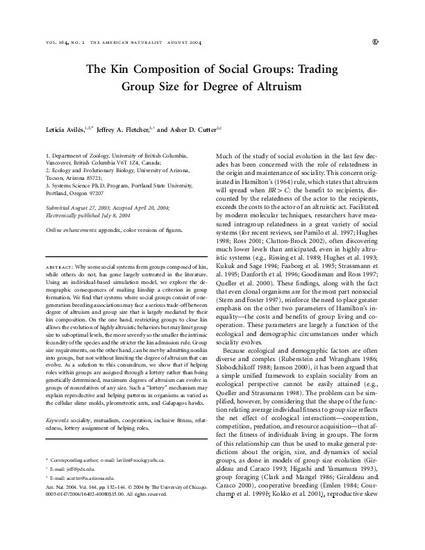 The Kin Composition of Social Groups: Trading Group Size for Degree of Altruism. Leticia Avilés, Jeffrey A. Fletcher, and Asher D. Cutter The American Naturalist , Vol. 164, No. 2 (August 2004), pp. 132-144. Published by: The University of Chicago Press for The American Society of Naturalists Article DOI: 10.1086/422263.